Designed and calibrated for optimum street performance in small-block and some big-block engines. Match with a variety of manifolds that include Edelbrock Performer, Performer EPS, Performer RPM, RPM Air-Gap, Torker II or other brands of similar design. Includes both timed and full vacuum ports for ignition advance. Electric choke can be added if needed. Electric Choke Kit #350-1478 can be added if needed. Want a great deal on a reconditioned carburetor? Here's your chance with top-quality Edelbrock Performer Carburetors. Not just rebuilt, but remanufactured for reliability and performance straight from the factory. Edelbrock Performer Factory Remanufactured Carburetors are meticulously disassembled, cleaned and reassembled with all new components and proper calibration. 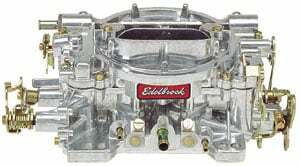 Does Edelbrock 9905 fit your vehicle? 9905 is rated 4.8 out of 5 by 4. Rated 5 out of 5 by Samber1013 from Carburetor Bought this for my husband for his 71 Chevy arrived in fast timely fashion...would have been amazing to use but he told me wrong one lol so had to return it...we love jegs as it is...thanks!!! will this carb fit a 1975 oldsmobile 350 motor. The intake would have to be changed for use on the Olds engine.